490 BioTech is the only company that offers substrate-free bioluminescent human cell lines capable of continuously and autonomously producing light. 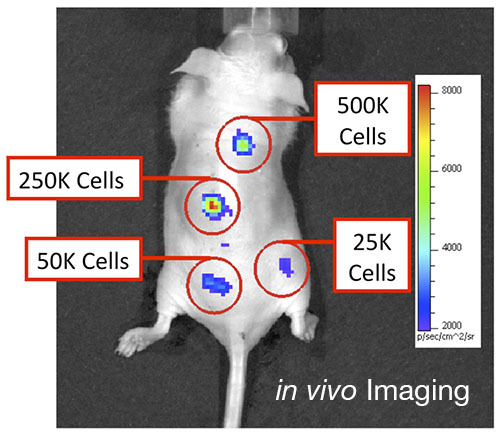 This revolutionary new approach to optical imaging provides you with increased data acquisition in both tissues and small animal models. By taking advantage of our continuously light producing human cell lines it has finally become possible to break free from the expensive and error prone introduction of substrate and get back to doing what you do best – getting data. 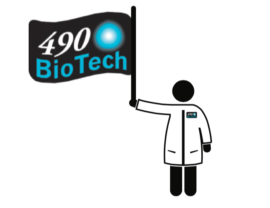 490 BioTech’s continuously bioluminescent cells are perfect for high throughput applications where the use of a luciferin requiring cell line would be cost prohibitive or where sample destruction would prevent repetitive data acquisition. Shown here in a 384 well format, our cells can be used across a wide variety of assay designs to suit your unique needs. Keep your animals and your IACUC happy by switching to continuously bioluminescent cells. 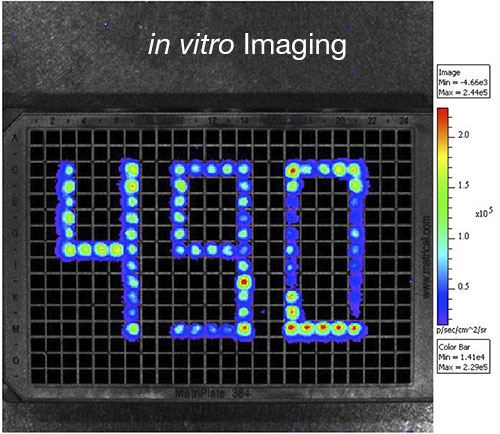 The bioluminescence from 490 BioTech’s cell lines can be imaged through tissue, allowing you to perform small animal studies without the repeated needle sticks required from luciferin induced systems. Head-to-head comparisons of 490 BioTech’s autobioluminescent cell lines versus conventional cell viability and proliferation assays under high-throughput screening formats. Published in The Journal of Laboratory Automation. 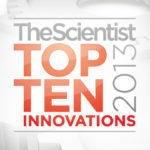 490 BioTech would like to thank The Scientist Magazine for recognizing our humanized bacterial luciferase as a Top 10 Innovation. Visit The Scientist for more information. 490 BioTech is pleased to be designated as a Highly Promising Company on the Pepperdine Graziadio Business School’s 2018 Most Fundable Companies List. We greatly appreciate the entrepreneurial expertise, guidance, and fundability assessment provided to us by Pepperdine University’s Graziadio Business School. Please see the press release here. 490 BioTech is honored to be recognized by the National Centre for the Replacement, Refinement, & Reduction of Animals in Research (NC3Rs) as a novel technology for reducing animal use and improving animal welfare. Visit the NC3Rs blog for more information. Join the substrate free revolution! We have an ever growing consortium of scientists and engineers using our cell lines to advance their innovative R&D objectives. Please contact us if we can assist you in achieving your research goals.